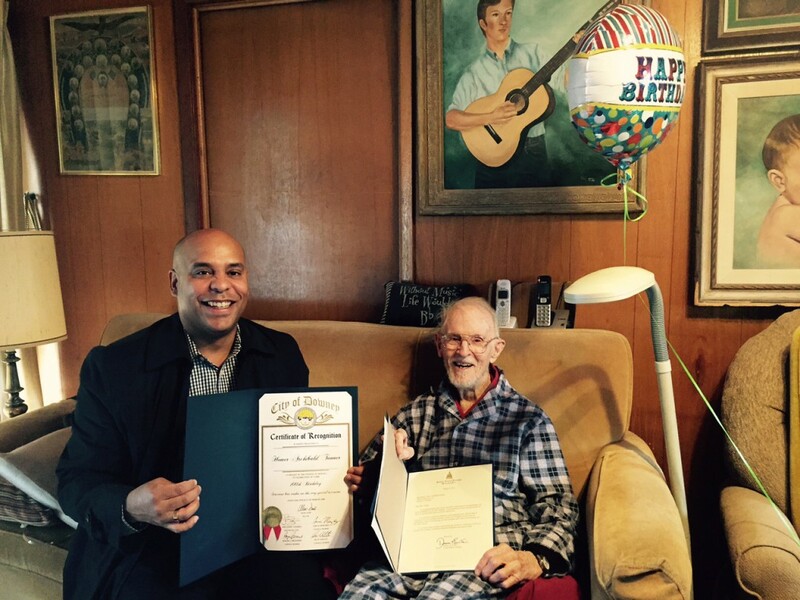 Today, Life Member Homer Archibald ‘Slim’ Tanner enjoyed the celebration of the century, literally — March 7, 2016 marks his 100th birthday! 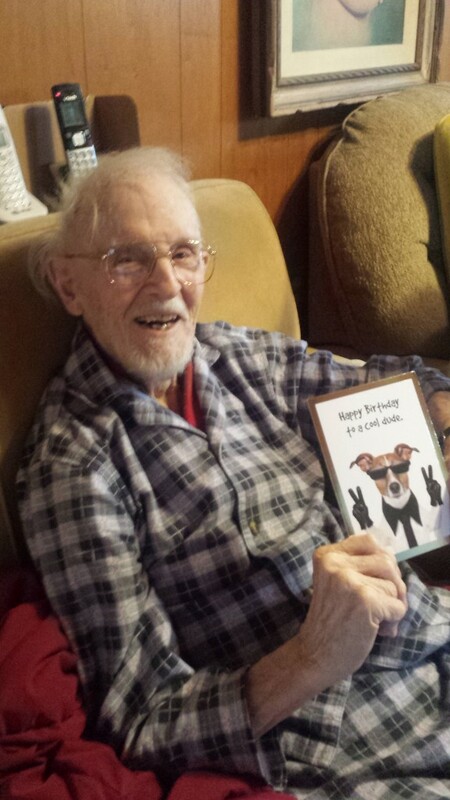 Happy 100th birthday to “one cool dude”! Though he’s suffering from a few health problems now, including a broken hip, Slim isn’t one to be kept down. His sunny disposition is matched by an infectious sense of humor, and his longtime partner, Tiny Todd, shares the same joie de vivre. You can’t help but smile along with them when in their company. With the help of Tiny, he still manages his way around the house, and sometimes even prepares their evening dinners. Slim commented that the greatest thing he’s gained from being a lifetime member of the Musicians Union is the pension plan, which he still receives payments from to this day. “It’s paid me back all that I put into it,” he said. Born in 1916, Pumpin Ridge, Kentucky, Slim always had an interest in music. The second of six boys, Slim and his family moved to Laurel, Delaware in 1922. His father, a musician, was also an army officer and educator and became superintendent of the local reform school, which Slim and his brothers attended. Though not an ideal situation for most young boys, Slim managed to find something good about it. “One of the perks for us was the freedom of being able to use the band room,” he said. 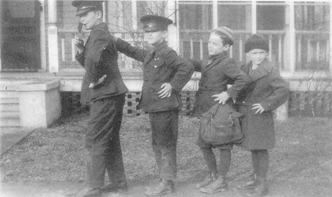 “We four brothers (two more would soon follow) each picked out an instrument to work on.” They formed a family band with their father as bandleader. Slim started college in 1933 at the University of Delaware as a math major. Soon after, the family band hit the road, playing their first gig in 1935 at the Palais Royal in Atlantic City, where Slim met his future wife, Mary, whom he married four years later. In the midst of the Depression, in 1938 the band broke up. Slim shifted from cello to bass and began accepting union gigs around town. During his formative years, Slim was known as quite the jokester. Not much has changed — every other word out of Slim’s mouth is a quick-witted quip about something or other, more often than not a wry jab at himself. In school Slim was voted most likely to be a circus clown, which wasn’t too far off; he had a brief stint playing in a circus band. In 1941, with brother Don, Slim joined the Sterling Young band and headed to Los Angeles. They arrived the day of the attack on Pearl Harbor. Don joined the Air Force Band in Washington, and Slim attempted to enlist in the navy in San Diego, but his bad eyes prevented it. Before long, some soldiers organizing bands for Camp Haan in Riverside auditioned Slim, and in June 1942 Slim enlisted in the 148th Infantry Band. While in the army, Vince Capasso, a French horn player from the Cincinnati Symphony, became Slim’s mentor, and the godfather of his first child. He also befriended Dave Brubeck, who would practice piano in the band’s day room. Slim spent four hours a day practicing tuba and string bass. 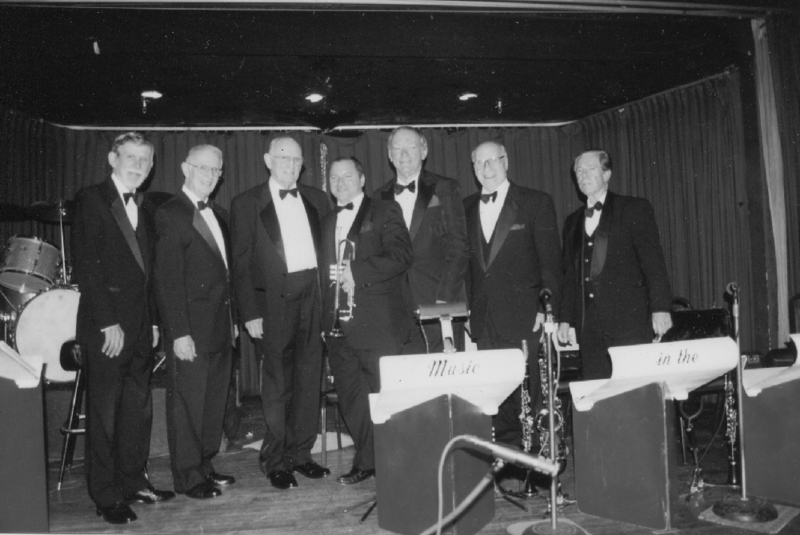 After the military, Slim joined the Houston Symphony in 1945 as a string bassist. He and his wife bought a 15-foot trailer and took off to Philadelphia, where he played in a comedy band with Harry Ranch. Under the GI Bill, Slim continued his education at the University of Houston where he earned straight A’s and three degrees in music composition and TV production. Though only six units away from a doctorate, he figured he’d only need it to teach, and decided not to go to the bother of completing it. Finally landing in Los Angeles, Slim bought a house in Burbank. He attended law school at UCLA for a while, but that didn’t last. “I found I liked playing music better than arguing with lawyers,” he said. He continued performing and recording for movies. 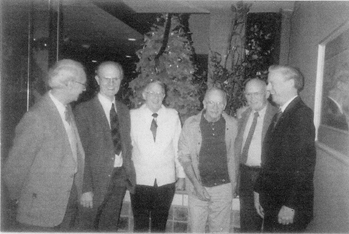 The last picture of all six Tanner brothers, taken circa 1992: Paul (75), Bob (78), Slim (76), Tim (59), Don (73) and Stu (67). Enjoying success on both bass and piano, during his career Slim closed out many a ballroom: with Benny Strong closing the Chateau Ballroom in the ’60s, Memo Bernabei closing the Phoenix Club in the ’70s, Chuck Foster closing Myron’s in the late ’80s, then Orrin Tucker closing the Stardust in the ’90s. He started working at the Mayflower Ballroom in Inglewood with Neil Lambert and his band in 1985, the year he lost his wife of nearly 50 years. After Neil’s death in 1993, Slim and brother Don kept it up until the ballroom closed in December 2008. 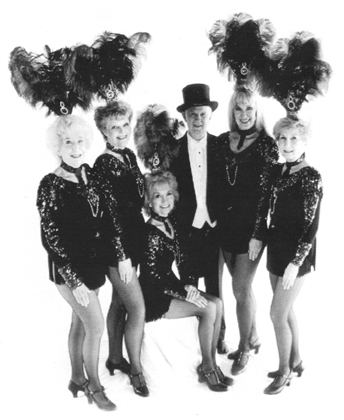 ALWAYS A LADIES MAN… Slim surrounded by his gal’s tap group, Tiny’s Troupers: Beverly, Lillian, Tiny, Helen and Flora. It was at the Mayflower where Slim met Tiny Todd, then the leader of the Dancing Grandmas tap troupe. Inseparable from the moment they met, the two became an item and began performing together at the Mayflower. They continued to perform as the tap group Tiny’s Troupers, with Slim serving as MC and even doing a little soft-shoe during the show. Today, Slim and Tiny live in a wonderfully decorated home in Downey, the walls adorned with beautiful paintings created by Tiny. 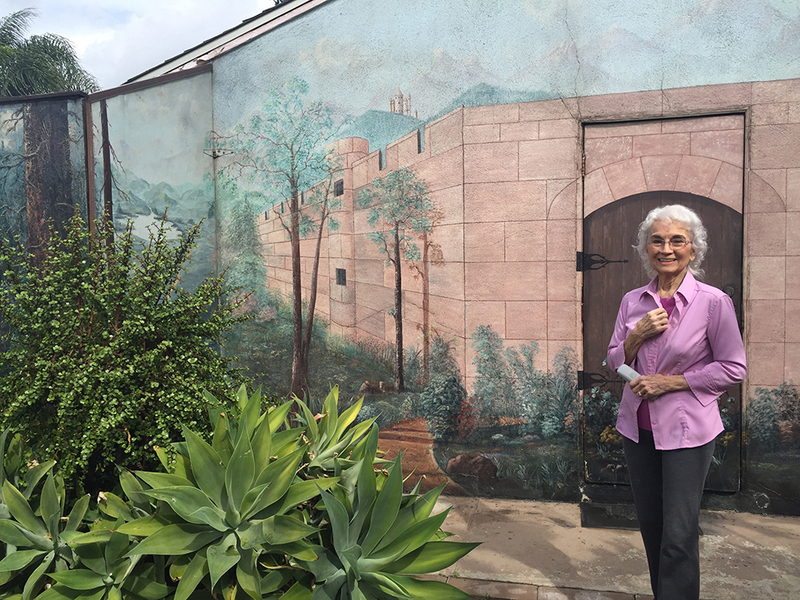 Tiny Todd in the backyard of her and Slim’s home in Downey, in front of her proudest painting: a castle wall. This entry was posted in All News, Features and tagged AFM, Life Member, Slim Tanner on March 7, 2016 by admin.